New York in the New York skyline via Notoriety Inc. 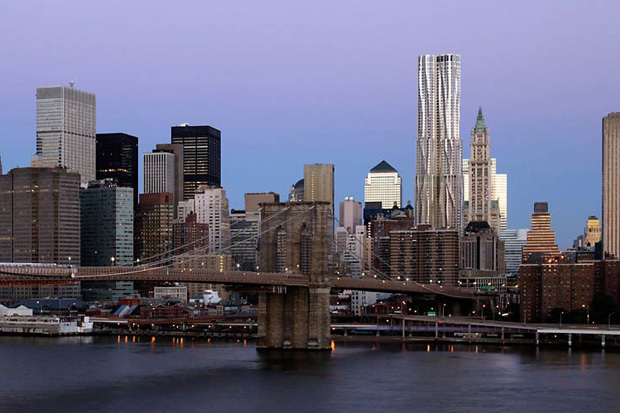 In our most recent post we talked about the encroaching grey scale of modern skylines. In this post we wanted to show you a few ways architects have used shape, instead of color, to differentiate their creations from the surrounding buildings. The visual appearance of predominately flat high gloss buildings has become ubiquitous as glass and steel become the preferred materials for skyscrapers. But within those constraints some very unique buildings have been recently designed. 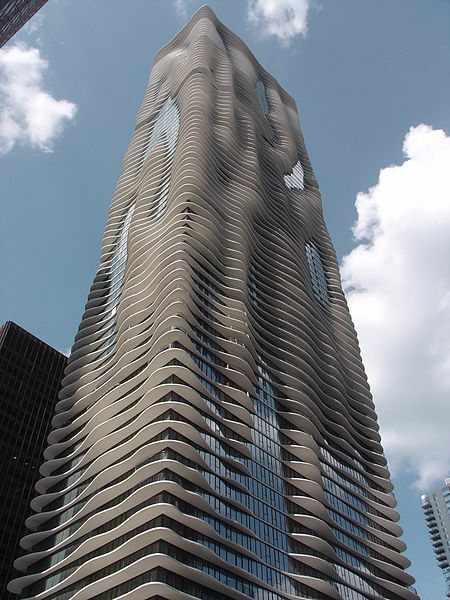 This is Aqua, a skyscraper in Chicago completed in 2010. It was designed by Jeanne Gang of Studio Gang Architects. The building won many awards for it ground breaking design. The wave like surface is made with a series of curved balconies, wrapping around the building in ripples. 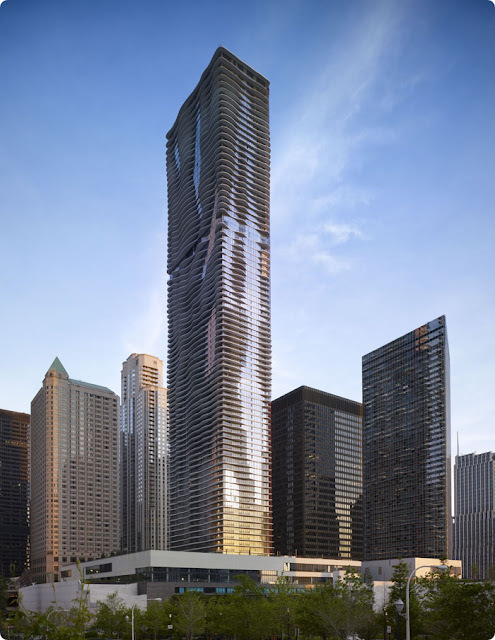 With a tall rectangular core and floor to ceiling windows, the basic structure of the Aqua makes it sound like it would melt into the background of similar downtown buildings. The unique design of the curving building skin makes it stand out dramatically. Even though this building lacks color variation from it neighbors it curved balconies give the over all structure a twisting undulating motion to the eye creating contrasts in color value. 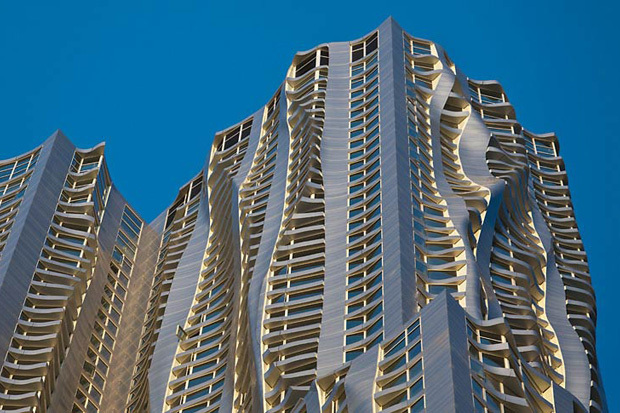 These wave forms, inspired by nature, are a unique way to augment the standard steel and glass skyscraper. Another great example of this direction in skyscrapers is the Frank Gehry residential high rise in New York. These rippling buildings look a bit like pebbles disturbing a smooth pond. They are breaking out of the formalized vertical curtain wall of the modern high rise. Gehry himself says the building is an architectural representation of the texture and energy of the city. Ripples pass through the seemingly other wise standard flat steel and glass high rise as through the winds were pulling the surface along with it. Their site has a great video showing the interaction of the the building with the city. New York via Notoriety Inc.
Up close we can see that Gehry too is using a fairly standard high rise model which is then augmented with shaped balconies and windowsills. These two building are great example of natural/modern hybrid skyscrapers. But not all uses of this shape focused innovation have come out to critical acclaim. 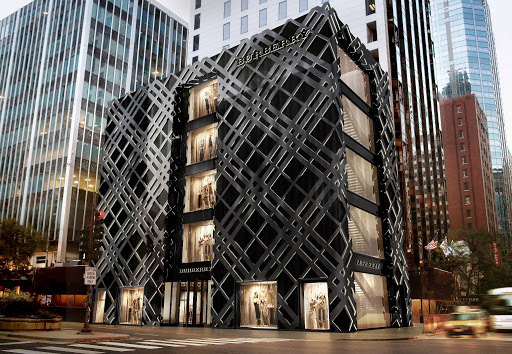 While not a high rise, the new Burberry flagship store in Chicago definitely tried to innovate inside the contemporary gray-scale palette. Architectural Record put it this way "Burberry works hard to hold on to an upper-crust image and to look forward at the same time. The clothing, accessories and ads do all that. But this building, with its backlit, angled, checked pattern is the dissonant score in the company repertoire. It is loud and vulgar. It's the car salesman who won't go away. Worst of all, it's not architecture -- it's a building as billboard." The architectural criticism is harsh and suggests the design concept was to cover the building in Burberry plaid. While still colorless and monochromatic, the contrasts in light and dark color value are notable Lets hope that color will tag along with shape innovation and lead to the potential for chromatic skylines in the future.